The challenge? Make and post a vegan Taco Bell crunch wrap for vegan snack down. This was one fun challenge. I only had the small flour tortillas- BUT next time I will buy both the large and small ones. This is so easy to make. Of course you can double or triple this recipe. Makes 1 Lg or 2 small crunch wrap(s). 1. Heat oil/water or veggie broth in the pan. Add onions. Sauté until soft. Toss in the garlic, stir cook for about 20 seconds before adding the feisty crumbles and rice. Cook until heated through. 2. Take the large wrap place the filling in it. 3. Place the chips on top of the cooked mixture to cover it up. Kinda flatten them. But make sure to leave big pieces. 4. Take your shredded lettuce, and diced tomatoes place on top of chips. Drizzle tons of cheese sauce on it. 5. Take the small wrap (or cut a large one to make it smaller. Place on top of the cheese mixture. 6. 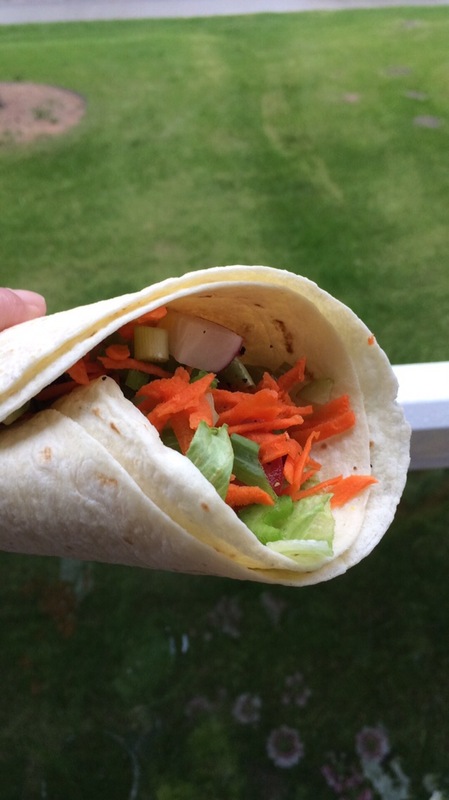 Take the edges of the larger wrap and fold it over the smaller one to all the yummy goodness is covered. Place seam side down in the heated pan pan. (I just used the same one I cooked the mixture in). 7. On medium to medium low heat, cook each side for about 4 mins until you get a nice golden brown colour. 8. Enjoy it with some daiya ranch and/or more cheese sauce. I can not put the cheese sauce recipe on my site as it’s in Jl’s new book: The Vegan Airfyer, however,Julie and Kittee had permission to post the cheesy fries recipe (They are hosting a giveaway for the book which closes Wed July 26 2017). Make sure to prepare the fries as well for a complete meal (I didn’t have potatoes so I missed out. But Jl spices the fries the same way I usually season mine- so I know they’re good! For another review and a chance to win The Vegan Airfryer, check out Mary Ellen’s blog V Nutrition. (Her contest closes Sat July 22 I think it is). Amy from Veggies Save The Day tweeted about this magical dish that immediately had me drooling and knew this is the sauce I needed to make for my crunch wrap. It would be good over broccoli, or nacho’s well- everything!! Try this recipe and let me know what you think of it. Just don’t blame me for the crunch wrap addiction 😀 Make sure to bookmark this page for those 3 am cravings and Taco Bell isn’t open. Is Taco Bell open at 3 am? Let’s just say no. Besides with this easy recipe you know that there will be no mistakes or cross-contamination so there’s no reason to leave the comfort of your home. Chia Spiced Chia Pudding. Dessert for breakfast? Yes please!! Photo credit goes to Becky from Glue and Glitter. 2. Raw spiralized thai salad. Photo credit goes to Rebecca from Strength and Sunshine. 3. Lazy falafel. This recipe knows me so well. I love easy recipes. Photo credit goes to Rhian from Rhian’s Recipes. 4. Easy vegan lentil salad. Healthy and can be done in 10 mins or less? Love it!! Photo credit goes to Mary Ellen from V Nutrition. 5. Hemp seed oatmeal NO BAKE cookies. Oh yessss she did!! Photo credit goes to Karissa from Karissa’s Vegan Kitchen. 6. Soba cold japanese buckwheat noodles. There’s something I love about Soba, they are great in almost everything! Photo credit goes to Kate from The Artful Appetite. 7. Ginger berry smoothie bowl. She had me at bowl *drool*. Photo credit belong to Mallory Maddox. 8. Maple tofu skewers. I’m in…. love maple and tofu and grilling. I don’t have a BBQ, but I would use my air fryer, or over a camp fire. Photo credit goes to Choclette Tin And Thyme. 9.Mango tofu summer rolls. If summer had a taste, I’m pretty sure this is what it would taste like. Photo credit goes to Amy from Veggies Save The Day. 10. Chickpea with garlic vinaigrette salad. My kind of salad… no lettuce 😀 Plus chickpeas and garlic? Yummy. Photo credit goes to Monica from The Hidden Veggies. 11. Peach jalapeno salsa. This is a creative way of using all the fresh juicy peaches this summer. Photo credit goes to Oliva from Lettuce Liv. 12. Balsamic bean salad. Now this would be great to take on a potluck picnic! Photo credit goes to Sarah from Fried Dandelions. 13. Tomato chickpea salad with cilantro and lime. This looks so fresh! Photo credit goes to Mel from A Virtual Vegan. 14. No bake apricot turmeric lemon energy bars. These would be perfect to take to the lake or the pool! 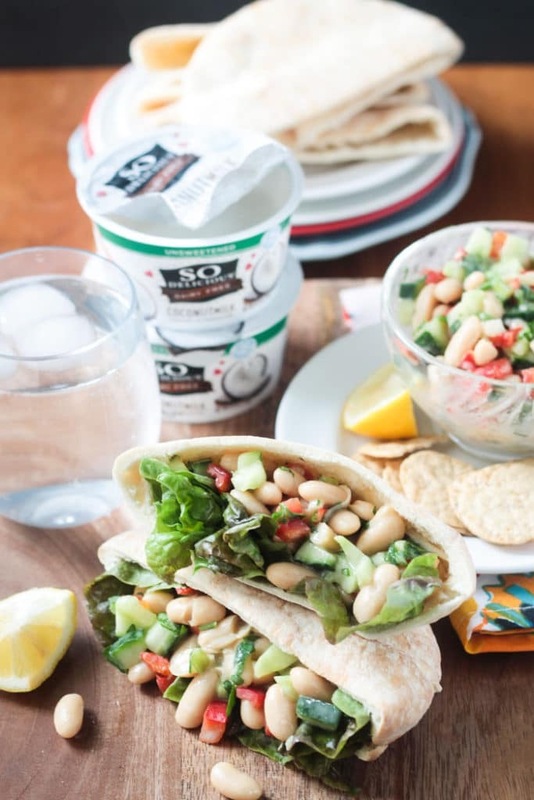 Also this passes as lunch to me 🙂 Photo credit goes to Sarah from Vegan Chickpea. 15. Cucumber salad with sesame soy dressing. 3 ingredients!!! Just 3! Photo credit goes to Elizabeth from The Lazy Broccoli. 16. Loaded veggie chopped kale salad. This looks fresh! Photo credit goes to Jen from Veggie Inspired. 17. Raw vegan bowl. It’s hard to resist a good bowl. So pretty. Photo credit goes to Yeukai from A Dash Of Lemon. 18. Spiralized beet salad. I always forget about golden beets, I always think red. So pretty. Photo credit belongs to Rebecca from Strength and Sunshine. 19. Simple Gazpacho. I don’t think I’ve ever tried gazpacho before, but what a great way to enjoy a nourishing soup on a hot summer day. Photo credit goes to Mary Ellen from V Nutrition and Wellness. 20. Turmeric chickpea salad sandwhich. There’s something just really satisfying about a chickpea salad sandwich. Photo credit go to Karissa from Karissa’s Vegan Kitchen. 21. 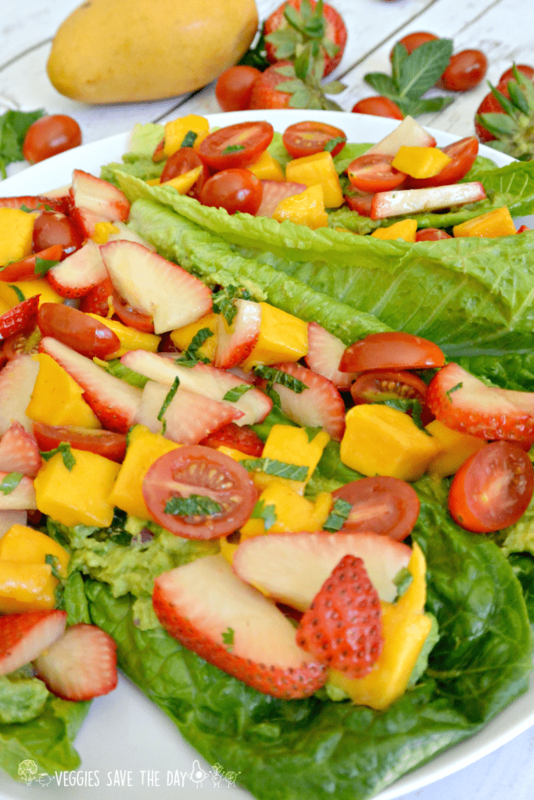 Raw strawberry mango avocado tacos. She had me at taco’s. Have you ever tried The Taco Cleanse? Seriously great book! Photo credit goes to Amy from Veggies Save The Day. 22. 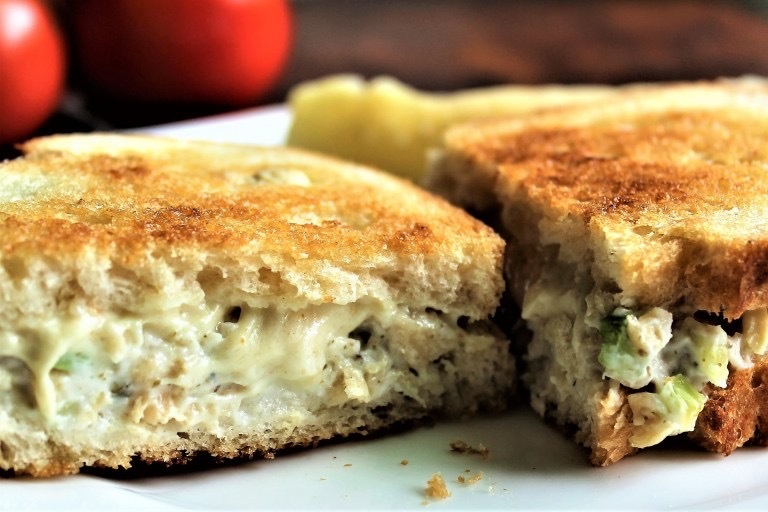 Vegan tuna salad tuna melt. Oh doesn’t that look like a gooey mess that you should make right away? Looks good! Photo credit belongs to Monica from The Hidden Veggies. 23.White Bean Salad. This is so easy to whip up. Photo credit goes to Jennifer from Veggie Inspired. 24. 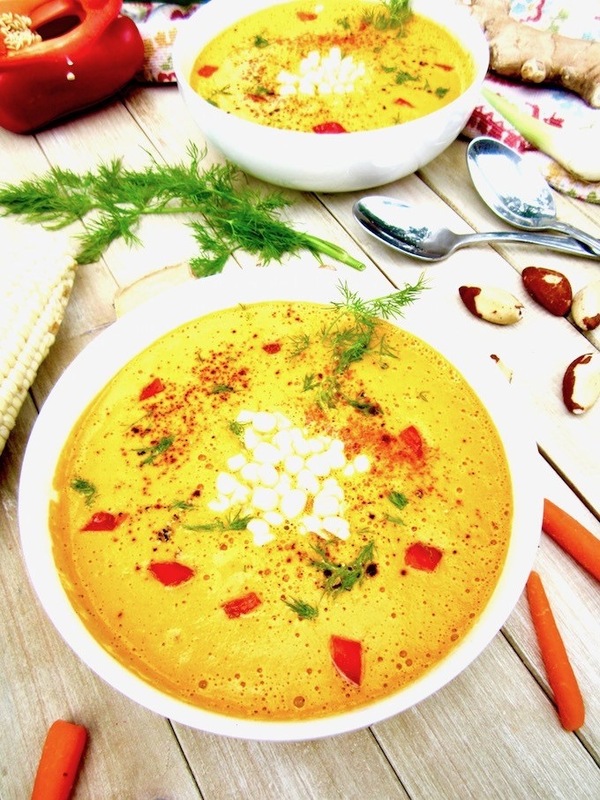 Raw carrot brazil nut soup. Looks very creamy! Photo credit goes to Sarah from Vegan Chickpea. 25. Thai Pad. Who doesn’t love a good Thai pad? Photo credit goes to Ania from Lazy Cat Kitchen. That is all for now. What’s your favourite cool summer eats? 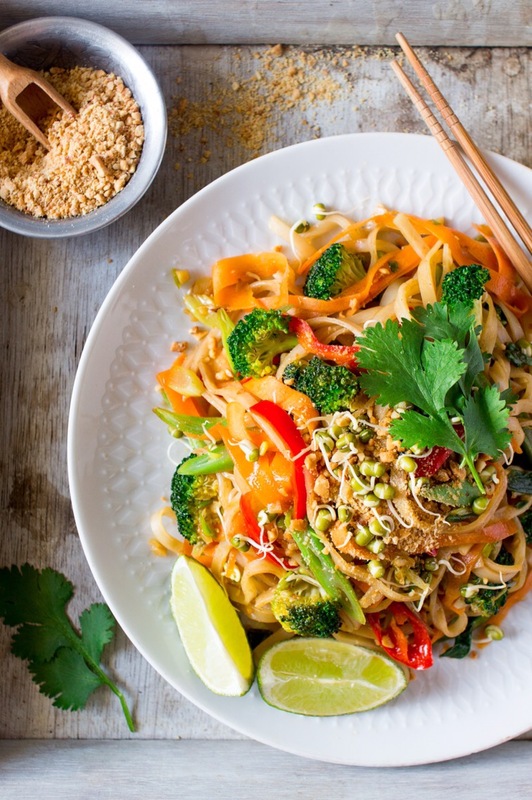 21 vegan recipes to jump start your day. This e-book is perfect for anyone who loves breakfast foods. Enjoy a hearty scramble at dinner or oatmeal for lunch, a juice for breakfast. What’s for Breakfast is divided by scrambles, porridges and puddings, drinks, I heart carbs, brunch and the basics. In the part The Basics, Dianne has a list of ingredients that she uses and tools you will need to make the recipe. Nothing weird or strange, in fact you likely have everything you need already. Well, a lot of people are not familiar with kala mamak which is also known as black salt, which is actually pinkish in colour- it gives tofu an eggy taste. 18 of the recipes are the most popular from her blog plus 3 brand new recipe, all in one e-book!!! The other night after we came home from the pool, I decided to make the tofu frittata. That night we were still in the middle of a heat wave, and I thought I would regret using the oven. The frittata is insanely easy to make. Perfect for a brunch where you have about an hour (the cooking time is about 40 mins) that you can just relax and take things easy. This heats up wonderfully in the air fryer for next day leftovers. (IF you have leftovers.) Oh and in case you are wondering if I felt regret? The only regret I had was not making it sooner. Ironically just shortly before the frittata was finished cooking, the wind picked up and Mother Nature cooled my home down. It was perfect. Guess what? Dianne is letting me share one recipe with you and I think you will really enjoy it. Be sure to add this to your Sunday brunch menu! expecting a crowd for brunch. 1. Preheat oven to 375°F and lightly grease a small casserole dish. for about 3 minutes, until it softens. Add the mushrooms and zucchini. son with a little salt and pepper, to taste. black pepper, and red pepper flakes, if using. Process until smooth. dish. Top with the tomato, scallions, and olives. 5. Bake for 40 to 45 minutes, until the frittata is firm and golden brown. 6. Let stand for about 5 minutes before slicing. Serve warm. To find out more about Dianne check out her blog Dianne’s Vegan Kitchen, she is also on facebook. I can’t wait to make the other 20 recipes!! Let me know what your favorite breakfast food is and enter for your chance to win Dianne’s book What’s for Breakfast click HERE. Forgive me for what I’m about to tell you, but you will have to make the best of it, and enjoy with these frozen treats. There’s about 6 weeks left of summer. I know some will be happy for the kids to be back in school, but for the rest of us, who enjoy the more relaxing schedule of summer, 6 weeks nearly isn’t long enough. I hope you enjoy this round up. Cherry Lemon Smoothie Popsicles. Photo credit goes to Becky from Glue and Glitter. 4 ingredients and that’s including ice. How simple? Well you’re there for this recipe, please have a look around because she has so many great recipes on her blog. 2. Vegan Vanilla Latte Rocket Pops. Photo credit goes to Kathy from Healthy Slow Cooking. I haven’t had a rocket pop since I was a kid. It’s time to make up for that. Be sure to browse Kathy’s site because this was one of 7 posted in the round up she did. 3. Mango Lime Pops. Photo credit goes to Jeanine and Jack from Love and Lemons. 4. Super Easy Vegan Fudgsicles. Photo credit goes to Margaret from Tree Hugger. 6. Cherry Lime Vodka Popsicles. Photo credit goes to Kristina over at Spabettie. Don’t worry you don’t need to add the vodka, Kristina has you covered. 7. Chocolate vegan ice cream sandwiches. Photo credit goes to Morgan over at My Vega. And if you just not in the mood to make even a sauce for your ice cream, there’s a few brands that you can buy pretty much in any store in the US and Canada. 9. Ben and Jerry’s non-dairy ice cream. I can only find 3 flavours in Canada, but I will take it. I’ve tried all three and they are great! Photo credit it goes to Ben and Jerry’s site. 10. So Delicious, not only do they have ice cream but bars as well. Their frozen treats live up to their name! Photo credit goes to the crew over at So Delicious. If I come across more beat the heat cool summer treats, I will add them. Or maybe do a part two. If you have a recipe you like to see featured, just let me know. We are in the middle of a heat wave and I do not like it. It’s hot and gross and there are only so many hours you can hang out in the grocery store before security starts following you around. Yes, I know I have been here every day for the past week for 8 hours straight and have only bought some bananas or grapes…. ok I haven’t done that, but lately, that’s all I’ve wanted to do. So, let’s turn to plan B. We will cool ourselves with some refreshing drinks, and even though alcohol will dehydrate you, you can have some every now and then, just make sure to drink lots of water. The first drink you don’t have to put in the vodka, it’s just as tasty without it. I would recommend you pulse some ice in a food processer to make it extra cold. 2. Dark Cherry Lime Slushy, photo credit goes to Brandi from The Vegan 8. I’m not a fan of cherries, but I wish I could reach through the screen and enjoy this slushy. 3. Pomegranate Swizzle, photo credit goes to Ginny from The Vegan in the Freezer. This drink calls for rum, but I’m sure it will be just as refreshing without it. 4. Heartbreaker Rose Syrup Cocktail, photo credit goes to Kathy from Healthy Slow Cooking. Now, I wouldn’t drink more than one of these, but it looks too pretty not to try it. 5. Creamsicle Smoothie. The photo credit goes to Dreena from Plant Powered Kitchen. Adults and kids alike can enjoy this treat. I’d be tempted to make extras and freeze it. 6. Creamy Blended Frozen Mocha. Photo Credit goes to Katie from Chocolate Covered Katie. I don’t drink coffee anymore, but this is exactly what I would be having for breakfast if I did. 7. Labor Day Pina Coladas. Photo credit goes to Chef Chloe. It may say labor day pina coladas, but I’m not waiting, minus the rum it’s a nice and refreshing taste of the tropics- to go with this heat we’re having. Just close your eyes and pretend you’re somewhere else. 8. Salted Caramel Cluster Vegan Shake. Photo credit goes to Mel from A Virtual Vegan. STOP THE PRESSES, this looks like I’m wanting this for dinner tonight!!! 9. Sparkling Watermelon Agua Fresca. Photo credit goes to Amy from Veggies Save The Day. This sparkling water with watermelon will be the hit of your pool party. 10. Peaches and Cream Nice Cream Float. Photo credit goes to Sarah from Fried Dandelions. Move over root beer float, we have a new favorite. Shh, we won’t tell them it’s healthy, ok Mom? 11. Kiwi Strawberry Crush Cocktail. Photo credit goes to Becky from Glue and Glitter. This looks really great! You could almost get away with saying it’s a salad. Vodka is made from potatoes and then there’s strawberries and kiwi. You’re welcome 😉 Just don’t over do it. 12. Power Grape Juice. Photo credit goes to Claire from Reboot with Joe. This is so easy to make and look at that lovely colour!! 13. Frosty Strawberry Lemonade with Mint. Photo credit goes to Somer from Vedged Out. Oh boy, this could be had all day long!! 14. Coquito Bonito. Photo credit goes to Terry from Vegan Latina. Sure, why not?! Maybe a little taste of Christmas will make things cooler…. 15. Double Chocolate Hazelnut Shookie. Photo credit goes to Annie from An Unrefined Vegan. Annie had me at double chocolate. 16. Strawberry Lemonade Bliss, by Tess. Photo credit goes to Michelle Donner. Lemonade is a staple during summer. I think you will love this one. 18. Peach Avocado Green Smoothie. Photo credit goes to Noelle from Singers Kitchen. What a great way to get an abundance of fruits and veggies into a glass. 19. Don’t Put Down that Glass of Matcha Tropical Smoothie .Photo credit goes to The Food Duo. Great smoothie to start your day right. 20. Watermelon MojiWatermelon Mojito. This is a nice and refreshing juice. I almost forgot about it. 21. Blissful Citrus Thirst Quencher. Photo credit goes to Miriam from Mouth Watering Vegan. This is what you need to take on your picnic. 22. Tropical Smoothie with Mango & Banana. Recipe by Becky from Glue and Glitter. 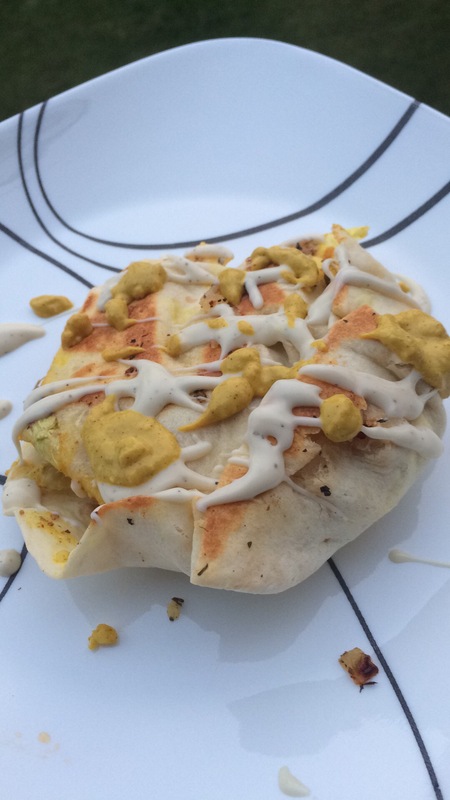 Photo credit goes to Cadry from Cadry’s Kitchen. 23. Virgin Banana Daiquiris. Photo credit goes to Rebecca from Strength and Sunshine. Looks perfect! 24. Nectarine Lemonade. Photo credit goes to Vicky and Ruth from May I Have That Recipe. 25. Pina Colada Smoothie . Photo credit goes to Marly from Namely Marly. It’s green!!! Love it! 26. Cardamom Cinnamon Turmeric Iced Tea. Photo credit goes to Richa from Vegan Richa.I think this would be great for after dinner. 27. White Chocolate Cake Strawberry Milkshake. Photo credit goes to Brandi from The Vegan 8. Now this is epic!! 28. Spiked Orange Julius. Photo credit goes to Jackie from Vegan Yack Attack, Hello beautiful!!! 29. Iced Vanilla Bean Matcha Latte. Photo credit goes to Angela from Oh She Glows. I want two! 30. 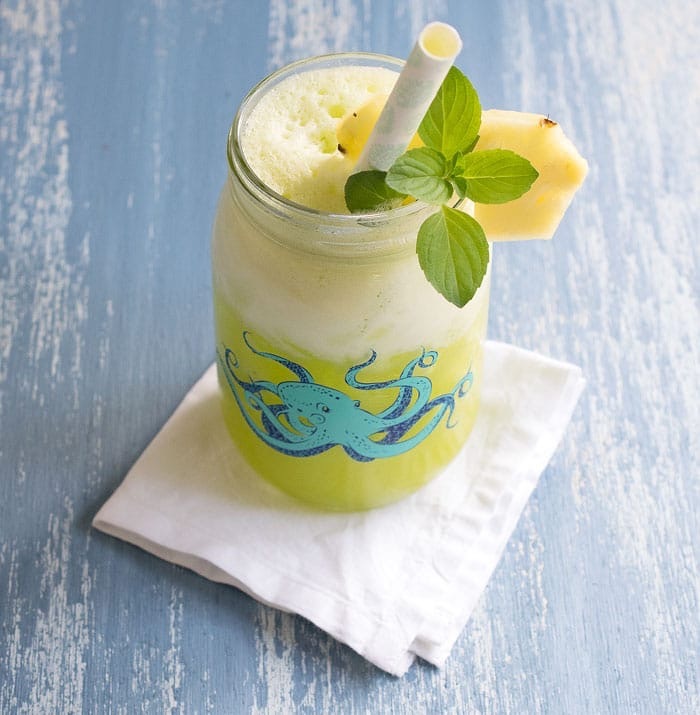 Piña Colada Smoothie. Photo credit goes to Melissa from Vegan Huggs. Looks refreshing. 31. Vanilla Mint Superfood Smoothies w/ Spirulina. Photo credit goes to Sarah from Well and Full. I love this colour, don’t you? 32. Healthy Purple Smoothie. Photo credit goes to Clint and Brooke from Grab Your Spork. I’m not a huge fan of blueberries, but I want this. 33. Ginger Switchel Floats with Cinnamon Ice Cream. Photo credit goes to Kristina from Spabettie. This will be worth the effort. 34. Watermelon Frosty. Photo credit goes to Kathy from Healthy Happy Life. Can’t wait to try this one. 35. Pineapple Mint Agua Fresca. Photo credit goes to Kathy from Healthy Slow Cooking. What a cute glass!! That’s all I have for now. If there’s a demand I will post more refreshing beat the heat drinks. Now that you have quenched your thirst, the next post will be about food. Stayed tuned.